There were 650 press releases posted in the last 24 hours and 153,315 in the last 365 days. How much does product photography cost? This article points to the fees charged by photographers. If you’re a photographer, you could be charging these also! TORONTO, ONTARIO, CANADA, March 6, 2019 /EINPresswire.com/ -- How much does product photography cost? More than ever, people are opening online stores and they need product photography. This article explores all of the cost to produce your product photographs. Prices can range from $10 to $50 per image and more, but there are no solid rules that govern product photography rates. Prices depend on the offering made by the photographer. Most charge by the piece or hour. In addition, some add royalty fees, studio costs and other line items. Photography is a craft and it takes time, skill, equipment, and a working space to do it. With every photo shoot, the photographer must set up the studio, photograph the subject and edit the images. If there is an on-site assignment, they must also pack the equipment, set it up and return it afterward. All of these tasks can add to the final production cost. It takes about as much time to make one muffin as it does a dozen. In the same logic, it takes about as much time to produce ten product shots as it does one. For this reason, many photographers charge a minimum order for smaller projects. Many photographers do not have a studio; others rent them. If your photographer has a studio or needs to rent one, they may charge a studio fee. If your particular photo shoot was very messy, the photographer may charge you to clean up the mess or dispose of the garbage. If your photographer needs to bring equipment to a location, this is a substantial amount of work. Your photographer needs to prepare, pack, deliver and assemble the onsite studio. After the photo shoot, they will also have to take it down and bring it back. This is a big deal and the photographer may charge you for that cost. Photographers are often hired to develop ideas. As consultants are paid for their knowledge so are photographers. Photographers are often asked to find locations or people for lifestyle product photography projects. These are very popular for Amazon product photos or eCommerce images. They may charge a fee to find or use these assets for the assignment. If the client has very specific requirements – such as a baby, that can add dramatically to the total production cost. Many Photographers never release the copyrights for the images they produce. In turn, they require the customer to pay a royalty every time the image is used. Merchandise sometimes requires cleaning, steaming, ironing, assembly, or some kind of preparation. 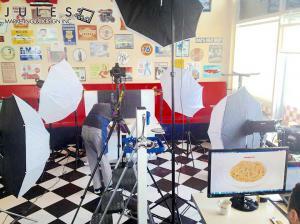 It is not uncommon for the photographer to charge for these product preparation services. Many photographers offer 360 product photography, bulk product photos, and a variety of other custom services. Pricing can vary for each studio. The modern photographer is a content creator and often offers graphic design services. Graphic work costs are relative to the assignment. Simple jobs cost less than do complex ones. Always ask for an estimate of the final price before assigning an artist to do a creative project. Sometimes you may need the photographer to coordinate the pickup of your merchandise. Pickup fees are relative to the project scope. Photographers are not limited to the above fees. It is entirely up to them which services and fees they offer and charge. Sometimes the photographer just wants to get the job and may offer a special deal to get the project. Be cautious not to push too hard for a because sometimes it's just bad business etiquette.